The coastline between Kjølnes and Kongsfjord is often rich in seabirds. KONGSØY is a large, grass covered island with steep cliffs. HELLØYA and SKARVHOLMEN are low-lying islands with minimal vegetation. The three islands have breeding Great Cormorant (Phalacrocorax carbo) (600 pairs), European Shag (P. aristotelis) (400 pairs), Black-legged Kittiwake (18,000 pairs), Razorbill (Alca torda) (less than 100 pairs) and Atlantic Puffin (Fratercula arctica) (less than 100 pairs). There are good observation spots along the road 890 and at the Veidnes peninsula. KONGSFJORDFJELLET and BÅTSFJORDFJELLET are easily accessible mountain areas in the centre of the Varanger peninsula. A visit in June or July may provide good birds almost everywhere along the road. A good starting point for exploring the area is Lake Gaednjajavri where the roads 890 and 891 meet. The many lakes, ponds and marshes hold breeding pairs of Red-throated Diver, Black-throated Diver (Gavia arctica), Northern Pintail (Anas acuta), Greater Scaup (Aythya marila), Long-tailed Duck, Red-necked Phalarope, Temminck's Stint (Calidris temmincki) and a variety of other species. Rock Ptarmigan (Lagopus muta) and Eurasian Dotterel (Charadrius morinellus) can be found in the highest altitudes. This is also a good area for Long-tailed Skua (Stercorarius longicaudus), Red-throated Pipit (Anthus cervinus), Shore Lark (Eremophila alpestris) and Lapland Bunting (Calcarius lapponicus). SYLTEFJORDSTAURAN is a steep coastline with important bird cliffs. Syltefjordstauran holds one of the northernmost colonies of Northern Gannets (Morus bassanus) (450 pairs) in the world, and the largest breeding colony of Black-legged Kittiwake (140,000 pairs) in Norway. Other breeding species are Common Guillemot (2,500 pairs), Brünnich's Guillemot (1,300 pairs), Razorbill (1,200 pairs) and Atlantic Puffin (100 pairs). The site is located on the northern side of Syltefjord. Follow road 890 and 891 from Tana bridge to Syltefjord. Boat trips are available from Nordfjord during summer. Another option is to walk the trail from Nordfjord to Syltefjordstauran (11 km). TANAMUNNINGEN is the estuary of the river Tana entering Tanafjord with extensive areas of shallow water, intertidal sand and gravel-banks, and subarctic coastal meadows. The biggest banks and meadows are east of the main river course. Høyholmen is a grass-covered islet in the estuary. Leirpollen is a small cove to the east. Tanamunningen is a very important site for seaduck outside the breeding season. Most males of the north-western European populations of Goosander (Mergus merganser) gather to moult here, or move here after moulting at fjords in Finnmark, in August-September. Unfortunately no reliable counts of this species have been made since the late 1980s. The number may well be much lower now, possibly below 10 000 individuals. Totally 19 species of ducks, 22 species of waders and 5 species of geese are recorded at Tanamunningen. 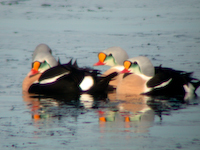 Many ducks winter in the open areas; especially Long-tailed Duck, Common Eider and King Eider. Summer visitors include White-tailed Eagle and Gyr Falcon. Passage species include Black-throated Diver (40 in autumn), Red-brested Merganser (1500), White-tailed Eagle (max. 7), Lesser White-fronted Goose and Red-necked Phalarope (80 in autumn). Both Temminck's and Little Stint are breeding. Possibilities for Arctic Warbler. VARANGERBOTN is a shallow estuary in the innermost part of the Varanger fjord. Large flocks of waders can be seen during migration, including summer-plumage Red Knot (Calidris canutus) and Bar-tailed Godwit (Limosa lapponica). Common Shelducks (Tadorna tadorna) are regular during the summer and the nearby shrubs and birch forests hold plenty of passerines including Bluethroat (Luscinia svecica), Pied Flycatcher (Ficedula hypoleuca) and Reed Bunting (Emberiza schoeniclus). 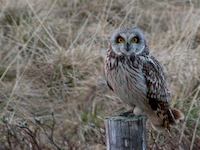 Good views can be obtained from two bird hides near the Varanger Sámi Museum. Both hides are accessible by wheelchair. Follow the short boardwalk from the designated parking area. NESSEBY CHURCH is located on a small peninsula about 13 km east of Varangerbotn. The southern tip of the peninsula is one of the best places along the fjord to look for seabirds in easterly wind. From the promontory there is a good chance to see King Eider, which occurs from here eastwards. Steller's Eider may be found all year round. Other possible species offshore include Northern Gannet, Northern Fulmar, Manx Shearwater (Puffinus puffinus), Sooty Shearwater (Puffinus griseus), Leach´s Storm Petrel (Oceanodroma leucorrhoa), European Storm Petrel (Hydrobates pelagicus), Great Skua, Pomarine Skua, Little Gull (Larus minutus) and Atlantic Puffin. The Red-necked Phalarope is regular in the small pool nearby. Breeding species include Common Shelduck, Temminck´s Stint and Arctic Tern (Sterna paradisaea) (2-300 pairs). Good numbers of migrating waders may be seen in July and August: Dunlin (1,750 ind. ), Red-necked Phalarope (380 ind. ), Bar-tailed Godwit (275 ind. ), Little Stint (300 ind. ), Common Ringed Plover (Charadrius hiaticula) (250 ind. ), Curlew Sandpiper (125 ind.) and Ruff (Philomachus pugnax) (125 ind.). Grey Phalarope (Phalaropus fulicarius) and Sabine's Gull (Larus sabini) may show up occasionally from July onwards. Large flocks of gulls often gather in the BERGEBYELVA RIVER MOUTH about 1.5 km east from Nesseby Church. The flocks should be carefully checked for Iceland Gull (Larus glaucoides), Lesser Black-backed Gull (L. fuscus) and Sabine´s Gull. Near the villages VESTRE JAKOBSELV and KARIEL there are several fields which often attract some interesting geese during spring migration. The Bean Goose (Anser fabalis) is most common, but it is also possible to come across Greylag Goose (A. anser), White-fronted Goose (A. albifrons), Pink-footed Goose (A. brachyrhynchus) and Barnacle Goose (Branta leucopsis). VADSØ is the main town on the Varanger peninsula, with shops and other facilities. Vadsø harbour is one of the best wintering sites for both King Eider (2,500 ind.) and Steller's Eider (3,500 ind.). Some Steller´s Eiders are usually present in summer as well. The harbour is also a good location to look for odd gulls, including Glaucous Gull, Iceland Gull and even the Kumlien's Gull (Larus kumlieni) which has been recorded a couple of times. A variety of waders are usually present along the shore just behind the Statoil petrol station. 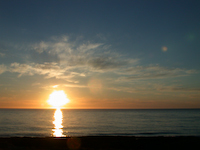 The nearby VADSØYA ISLAND can be reached by a driveable bridge from the town centre. Large flocks of Dunlins are common along the northern shore, as well as Common Redshank (Tringa totanus), Little Stint and Temminck's Stint. The passerines include Shore Lark and breeding Red-throated Pipit. However, during the summer most birdwatchers are attracted to the eastern part of Vadsøya where up to 200 Red-necked Phalaropes and a variety of ducks may be photographed in the small pool. In spring some Ruffs are usually leking nearby. Vadsøya also includes several cultural and historical sites; a "medieval town" from the 1500's, a Russian churchyard, war memorials and other cultural monuments. A mooring post for airships was built in relation to Roald Amundsen's North Pole expedition. His airship, "Norge", landed here in 1926 and was followed by the airship "Italia" in 1928, both on their way to the North Pole. SALTTJERN 8 km east of Vadsø is a good place to get close views of many waders. Leking Ruffs can sometimes be seen in the small marsh near the road. Both Pacific Golden Plover (Pluvialis fulva) and Ross's Gull are recorded occasionally. STORE EKKERØY is another interesting island connected to the mainland by a passable causeway. The island has some 50 m high cliffs in the south, marshes and pools in the interior and a sandy beach in the north. Store Ekkerøy is a good place to study a variety of migrating waders including Grey Plover (Pluvialis squaterola) and Sanderling (Calidris alba). The breeding passerines include Rock Pipit (Anthus petrosus), Red-throated Pipit, Shore Lark, Lapland Bunting and Snow Bunting (Plectrophenax nivalis). King Eider and Steller's Eider are often seen from the island (also in summer), and with some luck you may also see White-billed Diver, Northern Fulmar and all four species of skuas over the sea. About 20,000 pairs of Black-legged Kittiwake nest in the bird cliffs. These can be viewed very closely from the trail at the top of the cliff. Look out for whales and auks on the sea. Black Guillemots (Cepphus grylle) are common and Brünnich's Guillemots are seen regularly. A large number of Purple Sandpipers winter along the rocky shores. STORELVOSEN river mouth just east of Store Ekkerøy is also worth a stop. The endangered Lesser White-fronted Goose (Anser erythropus) is one of the many species recorded here. Interesting geese can also be found in the fields near SKALLELV a few kilometres further east. KOMAGVÆR is a good starting point if you want to explore the inland mountain areas. There is a bad dirt road leading north through the Komagværdalen valley for more than 10 km. Drive carefully! Among the many interesting species here are Whooper Swan (Cygnus cygnus), Greater Scaup and Eurasian Dotterel. Both White-tailed Eagle (Haliaeetus albicilla) and Arctic Skua are common. The small harbours INDRE KIBERG and KIBERG should always be checked for gulls and waders. Up to several hundred Glaucous Gulls are recorded in March some years, and small groups can be found even in summer. The Iceland Gull is not that numerous, but single birds occur regularly. KIBERGNESET has proved to be a good observation point for seabird migration, especially in autumn. This is actually the easternmost point in mainland Norway. To get there follow the dirt road which turns off from road E75 about 1,250 metres north of the main Kiberg turnoff. The small ponds on top of the mountain sometimes hold Greater Scaup. 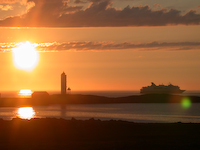 VARDØ is a fishing town located on two linked islands reached by a 3 km long road tunnel. The small pond below the star-shaped Vardøhus Fort is a good place to look for breeding passerines including Red-throated Pipit, Bluethroat and Sedge Warbler (Acrocephalus schoenobaenus). Both Pectoral Sandpiper (Calidris melanotos) and White-rumped Sandpiper (C. fuscicollis) have been recorded here. This is also one of the most reliable places for King Eider in summer. 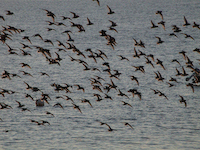 Sometimes small flocks of second year males are present offshore. A walk, or careful drive, northwards to SKAGEN on the western island may provide species like Twite (Carduelis flavirostris) and Snow Bunting in spring and summer. 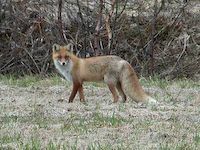 Birdwatching from HASSELNESET (the northern tip of the eastern island), may provide nice views of most of the interesting species breeding on Hornøy and Reinøy. The islands of HORNØY and REINØY are the easternmost seabird colonies along the Norwegian coast, and Hornøy actually constitutes the easternmost part of the Norwegian territory. The islands are both located 1,3 km northeast of Vardø town centre. The steep cliffs on the western side of Hornøy include major colonies of breeding Razorbill, Common Guillemot, Brünnich's Guillemot, Atlantic Puffin, Black-legged Kittiwake, European Shag and Great Cormorant. The bird populations vary depending on the food availability. Other seabirds breeding in the area include Common Eider, Black Guillemot, Herring Gull, Great Black-backed Gull, White-tailed Eagle, Red-throated Pipit, Lapland Bunting and Snow Bunting. The waters are very productive and large amounts of Small Sand Eels, Capelin and Herring constitute the main diet of nearly all the breeding seabirds. Dense flocks of several hundred King Eiders and Steller's Eiders are present from January to April, and most years a few individuals are still present during summer. The detour to HAMNINGBERG is a recommended supplement to every birdwatcher´s itinerary. The 40 km drive northwest from Vardø offers spectacular scenery, moon landscape, magnificent beaches and snow down to the sea level. Nobody is living permanently in Hamningberg anymore, but the old houses and cottages in this picturesque fishing community are visited by tourists between March and October. A great variety of seabirds and waders may be found during the breeding season, e.g. White-tailed Eagle, Little Stint, Ruddy Turnstone (Arenaria interpres) and Black-legged Kittiwake. Hamningberg is also one of the best locations for observing the Arctic seabird migration in May. The following numbers indicate what you can expect on a really good day: 18th May 1999: 300 White-billed Divers, 138 Red-throated Divers, 721 Pomarine Skuas, 263 Long-tailed Skuas, 400 Arctic Skuas and 2,000 Arctic Terns. 14th May 2001: 250 White-billed Divers, 73 Red-throated Divers, 225,000 Northern Fulmars, 80,000 Black-legged Kittiwakes, 5,000 Brünnich's/Common Guillemots, 75 Arctic Skuas, 3 Pomarine Skuas, 34 Glaucous Gulls, 1 Iceland Gull, 1 Snowy Owl (Bubo scandiacus) and 6 King Eiders. SVARTNES on the mainland just west of Vardø is a good location for Steller's Eider, Temminck's Stint, Common Snipe (Gallinago gallinago), Arctic Skua, Glaucous Gull, Short-eared Owl (Asio flammeus) and Red-throated Pipit. Mixed flocks of waders are often resting on the beach, and both Shore Lark and Sky Lark (Alauda arvensis) are regular among the sand dunes. The Snowy Owl is recorded occasionally. The mires of GRØHØGDMYRA and BARVIKMYRA usually provide good views of Red-throated Diver, Arctic Skua, Dunlin and Lapland Bunting. Bewick's Swan (Cygnus bewickii) is recorded occasionally. The coastline westwards from PERSFJORDEN deserves a careful check. There are usually plenty of seabirds offshore and both White-billed- and Great Northern Diver (Gavia immer) can be seen in May. White-tailed Eagle and Peregrine Falcon (Falco peregrinus) are recorded regularly during the summer, and passerines like Red-throated Pipit, Common Wheatear (Oenanthe oenanthe), Twite and Snow Bunting can be found along the road. White-throated Dipper (Cinclus cinclus) breeds locally and Ring Ouzel (Turdus torquata) may be found in the western slopes. Persfjorden is also a good location to look for sea mammals, especially Harp Seal (Phoca groenlandica), Harbour Porpoise (Phocoena phocoena) and Beluga (Delphinapterus leucas). The willow thickets in SANDFJORDEN also hold a variety of passerines including Redwing (Turdus iliacus), Brambling (Fringilla montifringilla) and Northern Redpoll (Carduelis flammea). This is also one of the best locations for Arctic Redpoll (Carduelis hornemanni). Access to Hornøya is only permitted within a limited area. Before landing, notice must be given to the Harbour Master, who wardens the area and has the authority to limit the number of visitors. From the floating stage on the western side of the island you are required to follow the marked footpath through the dense vegetation below the cliffs. The footpath is in places narrow, rocky and steep, but it provides splendid views of the birds and excellent photo opportunities. Eventually the footpath will take you to the eastern part of the island and the Vardø lighthouse. The highest point of the island is 65 metres above sea level.